PrayWorks is currently working with, Mountaineer Automotive, a Ford Lincoln dealership located in Beckley, West Virginia, on a comprehensive redevelopment of the dealership’s show rooms and facilities. “As an owner, the Lean process that Dave Pray is able to deliver has been less stressful in regards to working with contractors, subcontractors, and professionals; and in developing the plan and project objectives,” said Donnie Holcomb, President, Mountaineer Automotive. Lean Construction is a leading-edge construction methodology that breaks down traditional silos between builders, contractors, and trade partners. All parties are brought on board early in the project and work together to accomplish integrated, efficient planning and execution. 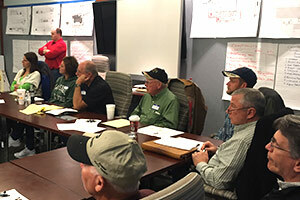 Mountaineer Automotive is the first business of its kind in West Virginia to apply Lean principles to a construction project. This project is believed to be the first of its kind in West Virginia. Dave Pray and the Mountaineer Automotive Team are certain that it won’t be the last.